The popular annual foodie-centric event takes place this Saturday, February 2 form 11am to 4pm. 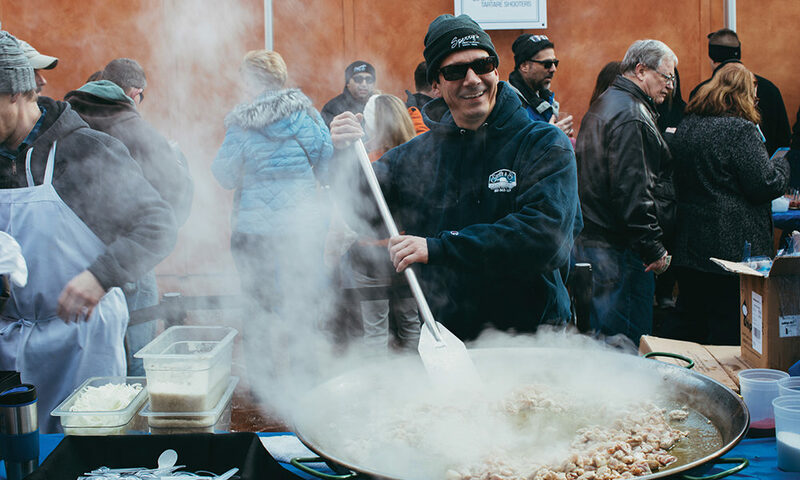 Temperatures may be dropping, but that won’t stop visitors from across the region turning up to Saratoga Chowderfest this Saturday, February 2. Now in its 21st year, Chowderfest will be packing Downtown Saratoga with hungry throngs from 11am-4pm. Attendees will have a broad choice of chowders to choose from, from savory to sweet, each for $1. Some of the county’s most popular restaurants—94 in all—will be busting out their 3-ounce sample cups and prepping ladles for the crowd, which is expected to reach 40,000 strong. Event-goers will surely be heading over to old favorites such as the Thirsty Owl Bistro on South Broadway, which has won “Best Chowder” honors the past two years in a row and will be serving up a seafood chowder this year; and Downtown mainstay, Ben & Jerry’s, who’ll be feeding the masses with a “Phish” ice cream chowder. After tasting as many chowders as they want to, patrons can cast votes on their favorites. Local chowder-makers will be up for a number of titles, including “People’s Choice,” “Best on Broadway” and “Best Newcomer.” Voting ends at 5pm and can be accomplished both online and in-person at the Saratoga Springs City Center or the Saratoga Springs Heritage Area Visitor Center. As Chowderfest fans know from previous years, it’s an all-day affair. Farmers Hardware will be starting things off early by throwing a pre-party from 8:30-11am, and the Visitor Center will be hosting an exciting clam dig for prizes from 12-2pm. On Lake Avenue, kids can enjoy face painting, crafts, a bouncy-bounce and other games. And when night falls, head on over to Bailey’s Cafe, The Ice House or Putnam Place for drinks or to catch a live performance that will help nurse that chowder coma you’ll probably be in.